Did you ever play tag as a kid? That’s the game where someone is “it” and they have to find someone else to tag. In most versions of tag, the tagged person is the next “it.” Once chosen, “it” must sprint off and make contact with someone else. Playing tag might have been fun when we were kids, but tag — the game — is not a good way to build strong connections. I know what you’re thinking: “Um, yeah Kit. So why are you bringing it up?” I’m talking about tag because I’m going to use the acronym TAG to help you remember how to form lasting connections and why you should! Since it’s a term you’re already familiar with and use, let’s use TAG to remember how to convert the people you meet into a strong and supportive professional network. When you think of TAGging your connections, I want you to remember to be Thoughtful, Authentic, and Generous. Thoughtful — A thoughtful networker is someone who considers how he or she can help others grow and develop their business. Being thoughtful means taking the time to consider if what you are sharing or offering really matches the needs of the person you’re connecting with. Ronnell Smith really nails it in his article for Moz, thoughtful interactions are personalized and respectful of your network members’ time. Here’s another T to remember when you consider being thoughtful — time. Invest your time in learning about the people in your network so that you can consistently provide them with valuable support and insights. Authentic — I know, I mention authenticity a lot. But being real is really important. People are naturally drawn to someone who is comfortable in his or her own skin. Marketing coach Amanda Young explains the benefits of authenticity this way, “Once you connect with the people you meet unconditionally, you become irresistible.” Plus, being yourself means that there’s a good chance that the people who respond to you most favorably genuinely like you. Life is hard enough without having to be fake around your friends. Generosity — Be giving. Discussing the power of generosity in an interview with Inc.’s Mindy Zetin, Andrew Sobel, author of Power Relationships, said, “The greatest networkers I know genuinely like to help others. They are always doing it.” Be willing to give even when there’s no guarantee that you’ll ever receive anything in return. We all have limited time and assets, so you have to choose your giving situations judiciously. But don’t let the fear of not receiving a return prevent you from being a generous person — professionally and personally. Besides, being generous often doesn’t cost you a thing! Be generous with compliments, encouragement, and thanks. It doesn’t take a lot of time to send someone a personal note telling them how much their contribution to a project or event meant to you. A note, share, or referral is an easy way to not only show your connections that you appreciate them but it also keeps you top of mind. Are you ready to up your TAG game? Developing strong business relationships is a lot like working on any other type of relationship. You have to invest you T — time and pay A — attention, to achieve your G — goals. Now before I go, I’m going to share one pro tip that doesn’t fit into my TAG acronym. When you meet someone at an event or conference, use LinkedIn or another app to locate and connect with them as soon as possible. The additional information you find will help you to better remember the person and learn more about them. I’m on LinkedIn and regularly share my tips and insights and those of my connections in my newsfeed. Come find me on Linked In or Twitter! If you have any questions, don’t hesitate to ask! 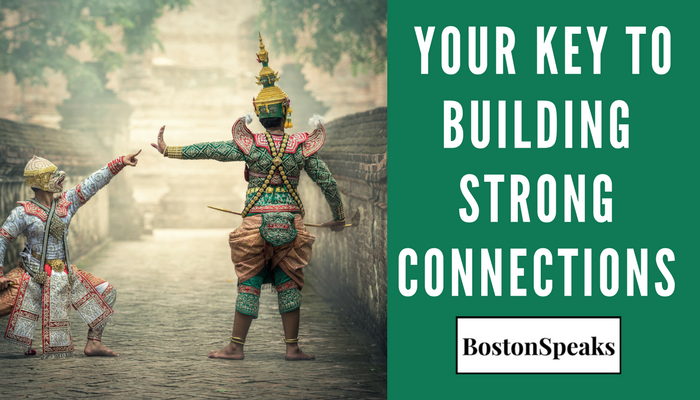 Learn even more about making the right connections, storytelling, public speaking and communication at theBostonSpeaks Blog or watch one of our weekly BostonSpeaksTalks.